Physical Description of Adult Butterfly : The forewing of the adult butterflies is strongly falcate and the hindwing produced at the tornus. 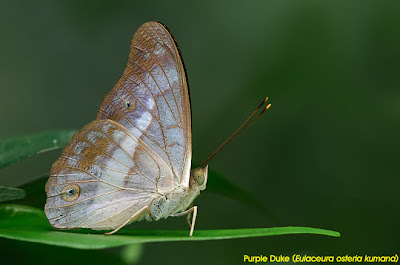 Males are pale purple brown above with a white discal fascia. The female is dull ochreous brown with obscure while fasciae in the distal halves of both wings. Field Observations of Butterfly Behaviour : Adult butterflies often fly rapidly along jungle paths and settle upside down on the undersides of leaves with their wings folded shut. When disturbed, the butterfly will zip off and display the same behaviour on the next leaf, usually flying short distances. 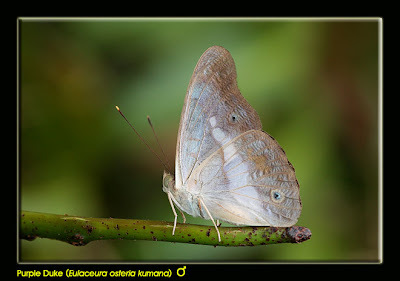 In the early morning hours, both the males and females are more likely to stop on the uppersides of leaves with wings opened flat to sunbathe. 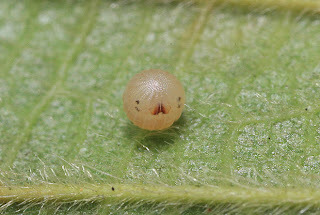 The female oviposits a single egg, usually on the underside of a leaf of the host plant. The egg is pinkish in colour, almost round with vertical ribs running down the length of the egg. 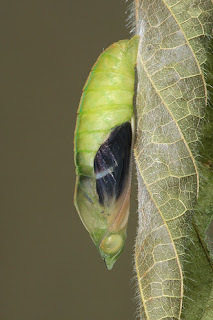 After about 3 days, the caterpillar hatches from the egg, and immediately starts to consume the eggshell completely. 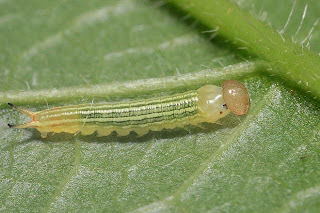 The caterpillar then searches for the younger leaves of the host plant and starts to eat the softer young shoots on the host plant. 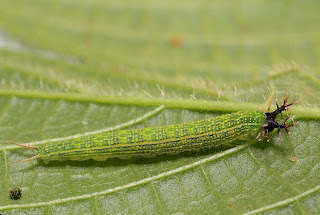 The 1st instar caterpillar has a smooth round head with lateral dark and light green stripes running the entire length of its body. It has a forked 'tail' which is a feature of this species in all the instars. 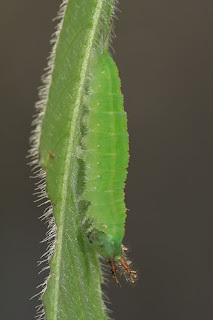 As it moults into the 2nd instar, the lateral green stripes are still there, but the head now takes on forked processes which are dark in colour, giving it an appearance of having 'antlers'. The caterpillar tends to hide on the undersides of the leaves of the host plant. 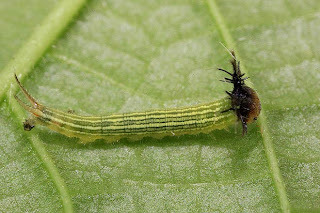 2nd instar caterpillar showing the black "antlered head" and forked tail. In the 3rd instar, the black 'antlers' are now more defined, but with light pink extremities. 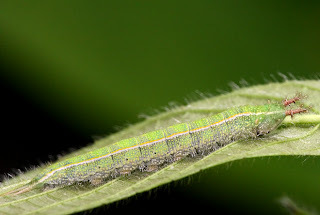 The green stripes of the early two instars are now replaced with two lateral green bordered yellow stripes running down the side of the caterpillar's body. There is a pattern of yellow spots over the entire body. 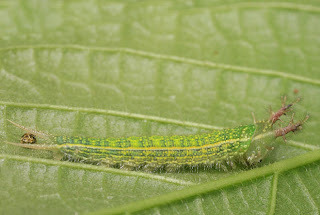 3rd instar caterpillar showing its black antlered head and sporting yellow/green spotted markings on its body. 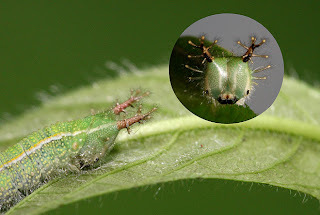 The 4th instar caterpillar is essentially similarly patterned as the 3rd instar, but the forked 'tails' are longer and the 'antlers' have now taken a light salmon colouration. The caterpillar remains on the underside of the host plant's leaf when not eating, and carefully aligns itself with a leaf rib such that it camouflages itself very well. 4th instar caterpillar with its salmon-coloured "antlers"
The 5th and final instar caterpillar sports two lateral salmon-coloured stripes which start from the base of the 'antlers' and runs the entire length of the body to the forked 'tails'. 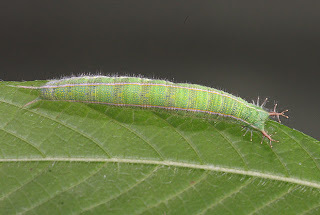 Alternate transverse light and dark green bands can also be seen running down the body of the caterpillar, perpendicular to the lateral stripes. 5th instar caterpillar Note the twin lateral stripes. Inset : Close up of the caterpillar's head. After a total of 38 days upon hatching from the egg, the caterpillar then goes into a day of dormant pre-pupation pose. 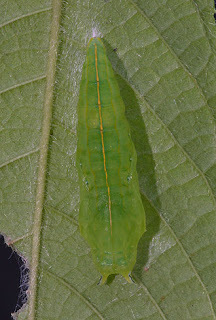 The caterpillar prepares for pupation by anchoring itself well on the underside of a leaf. Unlike many other species which has a girdle to support the pupa, or where the caterpillar curls up in a pre-pupation pose, the caterpillar of the Purple Duke remains flat on the underside of the host plant and keeps a low profile staying very close to the leaf. Pre-pupation pose of the caterpillar. It remains dormant in this position for about 24 hours. 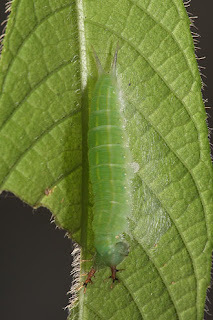 The pupa is light green with a single yellow lateral stripe down the back of the pupa. The head takes on a short horned appearance. The pupa hangs from its cremaster with its head facing downwards. Pupa of the Purple Duke. 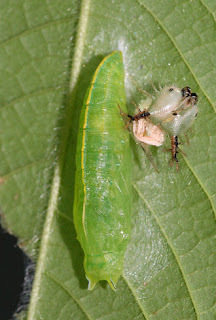 On the left photo, note the head of the caterpillar discarded as it transforms from a biting/chewing caterpillar into a pupa within which the process of metamorphosis changes it into a nectar-sucking butterfly with no biting mouth parts. After about 8 days, the pupal shell turns transparent and the wings of the soon-to-be-emerging butterfly can be seen through the pupal shell. 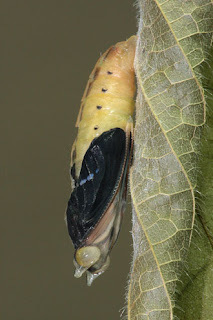 A few hours before eclosion, the pupa turns a warm beige with the wings becoming darker and more pronounced and distinctly visible through the pupal shell. All ready for eclosion. The wing patters of the adult butterfly can be seen through the now transparent pupal case. Finally, in the late morning, the adult butterfly ecloses and hang its wings out to dry, as it pumps fluids into the wings to expand them. It stays for about an hour or more to ensure that its wings are sufficiently dried and hardened before it takes its maiden flight to search for its mate and continue the circle of life.